Our Tamper Evident Security Labels can be authenticated instantly without the need to enter additional information. Real-time tracking of customer product scanning data ensures instant detection of unwanted grey market and product diversion actives. CertiEye's online brand protection software will eliminate the need for brand protection teams to perform complex online searches. CertiEye targeted messaging ensures each customer will only receive messages of high relevance to their location and personal interests. The CertiEye app is a free Smartphone application that can be used to scan your tamper evident security label allowing the end consumer, customs agents or other IP enforcement authorities to instantly confirm the product's authenticity. 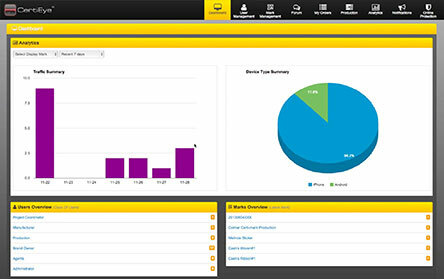 The CertiEye online platform will instantly alert the brand owner each time an out of region scan is detected. This helps to make the investigation of potential grey market and product diversion activities a far less complicated task. CertiEye's online platform enables registered users to very quickly and easily monitor E-Commerce and Social Media websites. Never before has there been an easier way to supervise external E-Commerce and Social Media activities concerning your brand. CertiEye targeted messaging allows marketing teams to send promotional messages and offers directly to the smartphones of their customer base. Messages and offers can be specifically targeted to a predetermined customer demographic and geographic location ensuring that messages will hold a high level of relevance to each individual consumer. 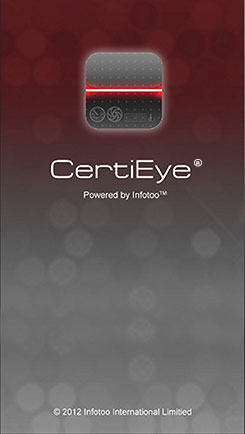 Scan by CertiEye app to authenticate the product anywhere, anytime. All scans of a scans of our tamper evident labels are picked up and stored on the CertiEye platform. 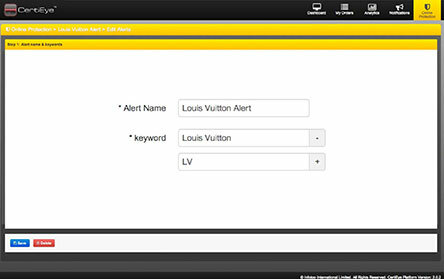 Alerts if/when abnormal Counterfeit or Out of region scans are detected. CertiEye's e-commerce website tracking platform makes the task of detecting online counterfeit products easy. The search engine will display the most relevant links to your chosen search criteria for you to study. 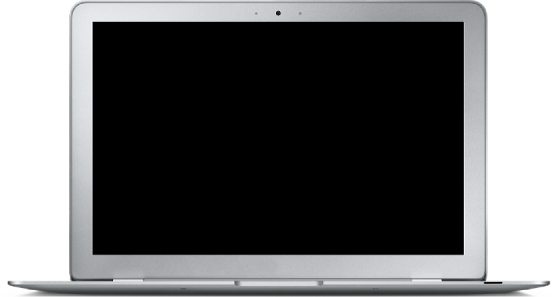 CertiEye allows brand owners to select targeted customers for promotions based on their scanning and web page viewing behavior. Push notifications will be directly send to selected customers and prospects. CertiEye is now a registered solutions provider to the World Customs Organization via their IPM platform and is accessible to Customs agents in over 80% of countries worldwide. CertiEye Provides Anti Counterfeit Solutions Across a Range of Different industries. Become a CertiEye Partner Grow your revenue with the CertiEye partner program. © 2011-2019 Infotoo International Ltd. All Rights Reserved.